Home » Blog » What is Coordination? Coordination is a set of motoric actions joint for a desired action and movement. As the coordination is visual in the form of movement, the movement comes from musculoskeletal system with the neural processes in the brain and spinal cord, which control, plan, and relay motor commands. 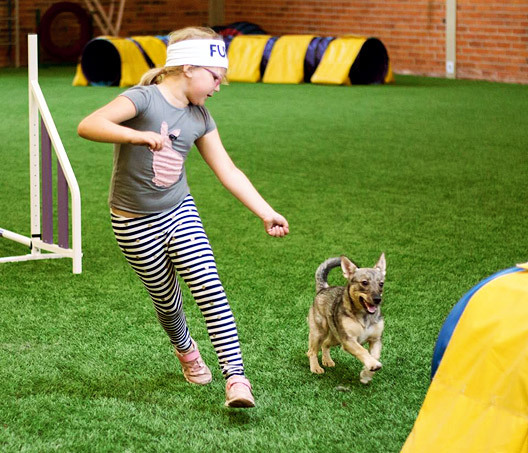 One good example of coordination in action for an agility handler is the send forward, where the handlers hands, legs and sight should work together to point out the direction for the dog. For the sending movement to be well timed, smooth and efficient, the handler needs to practice hand-leg coordination, eye-hand coordination, eye-hand-leg coordination and the perception of the surrounding space, time and movement. In the picture above, you can see a great, well-coordinated handling. If you look at how the girl is positioned, you will see how she is reparing for a front gross, right hand ready to lead. A child needs more practice than an adult and it’s good to train these skills with and without a dog. We at Funna make this learning fun and effective with many kinds of games that inspire children!